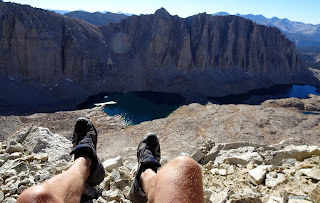 I will start out with some comments on the three big ones (pack, shelter and sleeping gear), the pieces of gear that are heaviest and most crucial to reduce the weight of. More background on why I did choose them can be found in this article, here I will focus on how they worked during my hike. This pack did turn out to be just as ideal for my trip as I had hoped. 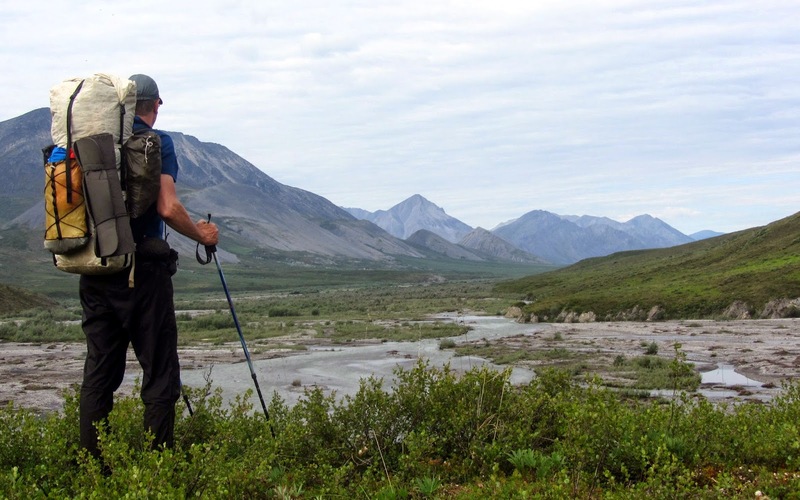 When starting out from Joe Creek, close to the Yukon border it weighed some 25 kilos with food for 16 days (14 days planned hiking to my halfway food cache plus two days extra). As you can see from the photo below this food and fuel plus my gear (base weight 9,4 kilos) filled the bag completely. But I could close the roll top properly and the suspension system worked fine with this weight. Carrying a pack this heavy is never particularly enjoyable , but I doubt that any other pack could have been noticably more comfortable. As the volume and weight of the food decreased the pack also compressed very nicely. On the outside of the pack I had my Trailstar shelter and inner tent attached through some loops I had sown onto the original pack sack. You can this olive bag between my hands on the photo above. Since tents are very often wet when packed in the morning, I prefer to keep them outside the pack. For drainage I hade made a half dozen small holes in the bottom of the stuff sack with a soldering iron. I also had my closed cell foam sleeping pad attached with bungy cords, for quick release, on the outside. Visible in the photo above is the yellow pocket I made myself, more or less patterned on the Porter Stuff Pocket available from HMG. In this I carried my rain gear, Goretex socks, neopren socks and camera tripod. Visible in the first photo of this blog entry, on the left side from the back, is a small black pouch from Laufbursche containing my cup and snack bag. A similar, slightly smaller pouch, was attached to the hipbelt and contained map, compass and kamera. And occasionally a GPS. All these arrangements worked very well, but I had used the same setup for Coast2Coast Sweden 2014, so I was not surprised. The pack withstood some serious abuse when sliding and slipping down differet rock faces with only a tiny hole at the bottom showing, easily fixed with duck tape. 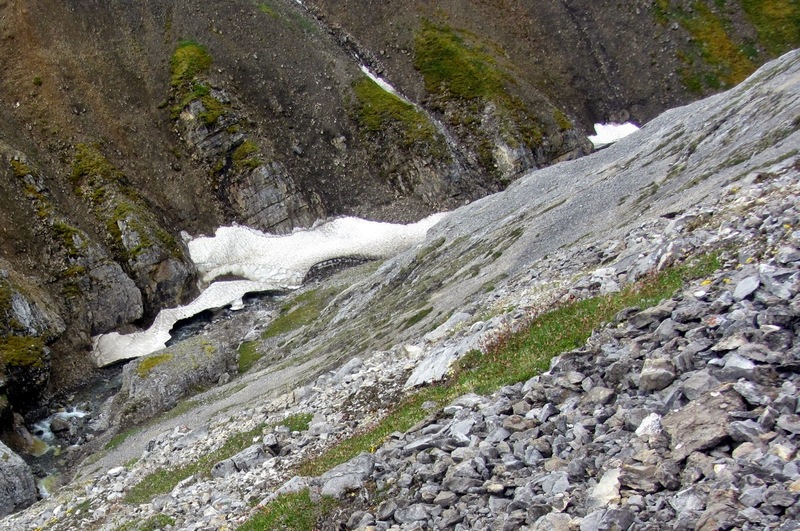 The Porter pack also on one occassion fell and rolled a couple of hundred meters down a steep incline, during which tent and sleeping pad were ripped loose and camera, compass, tripod and Spot Messenger where completely ruined.. The pack, which I fortunately was not wearing at the time, ended up on a snow bridge at the bottom of the ravine, with a 150 mm rip along one of the daisy chains near the bottom of the main pack compartment. This rip was easily mended with needle and some dental floss and this worked without problems for the remaining weeks of my trip. It still looks good, in fact. Overall, I am very satisfied with the HMG Porter Pack 4400 and cannot really imagine any other pack not weighing more than 1060 grams doing a better job. So if you are carrying up to 25 kilos I can certainly testify that you need no pack heavier than this. The Trailstar also worked just as well as I had hoped and anticipated. With my homemade 230 gram innertent it was a marvelously bug free haven. The combined weight of my shelter including pegs was 900 grams. 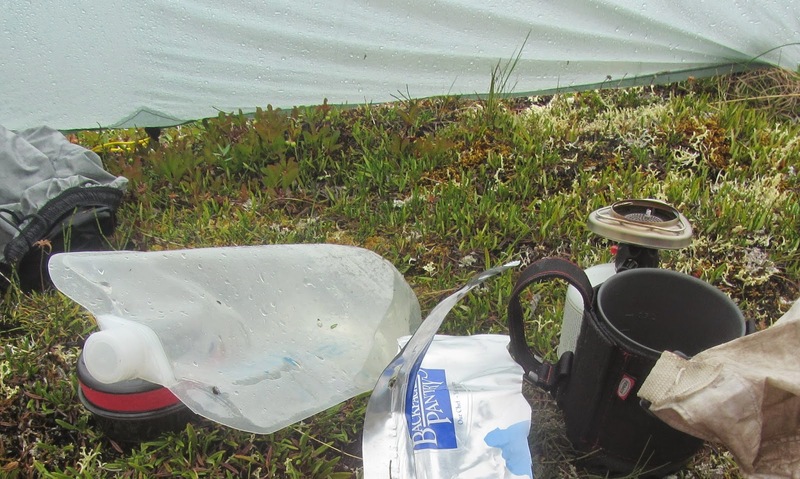 Certainly not the lightest combination possible, but more spacious and with less condensation than many double skin tents of similar weight. I also consider a weight penalty of a couple of hundred grams more than acceptable for the comfort and stability offered by the Trailstar. Personally I am a bit sceptical to the pyramid tents popular right now, since their steeper walls seem to offer more grip for strong winds. 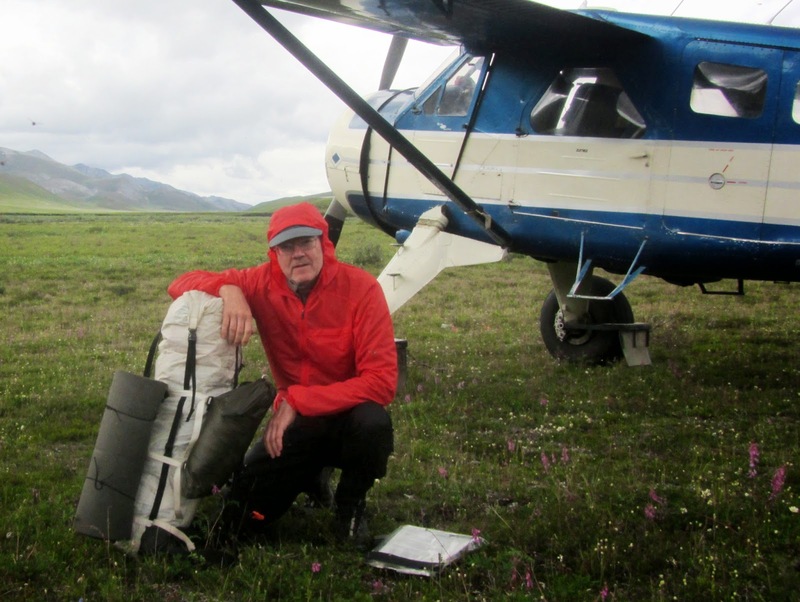 I had a pyramid tent break on me in high winds on the tundra many years ago. But times change and new materials and constructions appear, many people swear by the moden pyramids. However, with this background I find the lower and more squat profile of the Trailstar more appetizing to my particular palate. Also, I find it an absolutely brilliant construction, made from five triangular pieces of fabric with no zippers or buttons to close it with.This certainly is thinking out of the box and making things simple. The first night out I pitched the opening away from the prevailing wind. 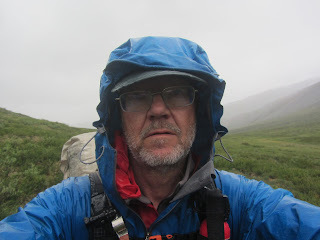 Twenty minutes later the wind switched 180 degrees and a rain storm beat at the tent for some fifteen minutes. It certainly rattled things and I went outside and checked the pegs, but I need not have worried. The shelter was firmly anchored. You can watch part of this in video below. I recommend turning the sound way up high to get the right feeling. The tent is amazingly steady. It often rained at nights, my impression was that it rained two nights out of three, but that is just an impression. Not seldom the rain seemed to last more or less all night. 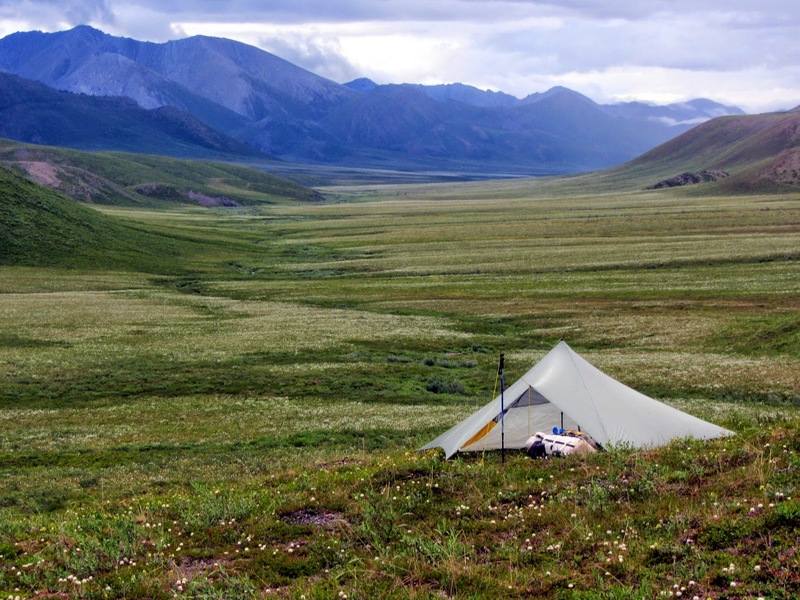 A couple of times a drop or two fell inside the tent from where the small carabiners are attached to the Trailstar. These carabiners are used to hold the inner tent. This was no problem, just a reminder that this obviously is a week spot when seam sealing. I do not know if I will bother with fixing this since the seam sealing I did seemed all right. All things considered the Trailstar is the overall best shelter for demanding tundra travel that I have ever used. The fact that it can also be used as a two person shelter is another benefit for anyone with a limited budget. This leaves limited space for gear under a roof, but I do personally not see this as a big problem. If my pack can be out in the rain during the day it can certainly be out in the rain during the night. The important thing is to have a bit of space where to cook in inclement weather, and that you have. On the chillier nights ( I had a couple with frost or near frost at the end of the trip) it was obivous that there was not much down protecting my chest area in the 2-3 baffles next to my chin. Since I have some high quality down from a quilt project some years ago I will probably add a couple of handfuls. Or I might consider buying a new sleeping bag. For these chilly nights I was wearing most of my clothing (except rain gear) and still could not keep warm enough to sleep. So for 2-3 nights I used the old trick with a hot water bottle to get some sleep and comfort. Half a liter brought to a boil on my stove poured into half a liter of cold water in my 2 liter Platypus made for a pliable and warm but not scalding companion in my sleeping bag. Those nights I woke chilled around 2 o'clock in the morning and my Platypus kept me warm for several hours. Twice I re-heated the water around 4 o'clock which kept me comfortable for the remaining hours of the night. One night I used the hot water bottle to dry things out before I went to sleep. The biggest disappointment was the Neoair XLite small. 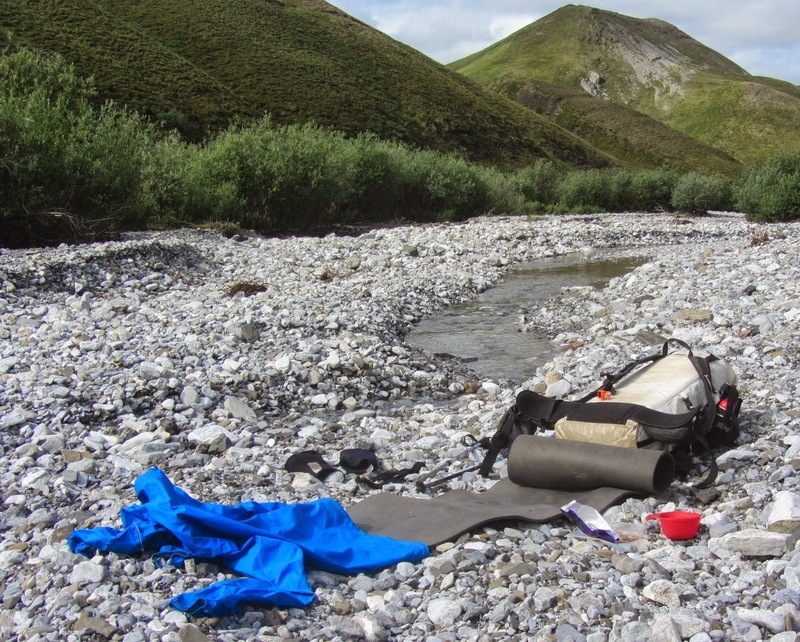 Three years ago, along the Nahanni, the Neoair I was using started leaking a bit, making it necessary to inflate it once during the night. All attempts to find the leak while in the field failed. In fact, even a couple of attempts back home after that trip has failed to reveal the obviously very tiny hole. Now the same thing happened again; after a couple of nights the Neoair started leaking slightly. And again I failed to locate the hole and make repairs in the field. On occassion the pad did not leak hardly at all, but usually I found myself sleeping on the hard ground around 3 o'clock in the night and was forced to some acrobatics in order to inflate it anew. Needless to say I am getting pretty tired of expensive pads leaking when you need them and not being able to fix the leak. However, since I always use the Neoairs in conjunction with a closed cell pad I was in no danger of getting dangerously chilled because of this. I use the Neoair for comfort and it is indeed very comfortable as long as it holds its air. My closed cell pad for this trip (and not new by any means, I have used it for more than a year) is the Laufbursche UL mat. And if the Neoairs have failed to entuse me, this cannot be said for this pad from the German cottage manufacturer. It is by far the best closed cell foam pad I have ever used. And I have used a few in my time. It is wonderfully long and serves as a comfortable protection against wet, cold and hard ground on all my hourly breaks. And it still only weighs 150 grams. It has also proved to be tougher than any similar pad I have used. At night I put the Neoair on top of it and it insulates my legs while the short Neoair (supposedly) keeps my hip and shoulder softly ensconced. This is what I need for comfort, my legs truly do not notice any difference between resting on the closed cell pad or on a long Neoair. That concludes my impressions of the three big ones that I used for Brooks Range. If the Neoair had held up it would have been a perfect set. Having had a slightly warmer sleeping bag might have been an advantage, but some nights the temperature in the tent was +25 C at midnight and some nights it was -2C, so overall everything worked as planned and when the snow and below freezing temperatures hit I could use the hot water bottle as a backup. This is a backup that one should always have in mind. Even on unexpectedly bitterly cold winter nights, heating some water every hour if necessaary, is sure to keep one alive, if not comfortable. I will add some more reflections on other gear that I used for my vacation in the near future. That must have been pretty hard fall for your pack, I am glad you were able to retrieve it, how it came to fall must also be an interesting story. I agree that the Porter is a great load carrier, I have not put more than 20 kg in it but it carries well. Your comments on the lower height trailstar versus a mid are informative, this is also why I have often been tempted but have shied away from a mid up north, The Stratospire with 2 poles and hexagonal base works well, more about that in a later report. As for mats, I can feel your frustration. I wonder if using a heavier duty mat such as an Xtherm or AllSeasons, is a better option for longevity? Or do you go back to self inflators with their tougher surface? Finally +1 on the Laufbursche mat, by far the best foam mat around these parts. Marianne, about the pad getting wet: No, I have one 'underside' and one 'upside' that I always use. After a break, before rolling I fold it with the 'upside' together and then roll it. This keeps the side I am sitting on and sleeping on reasonably dry even in very rainy weather and it also keeps it clean. Something that is particularly important when you travel in 'silty' country, along rivers that flood regularly. Like in the Brooks and along the Nahanni. 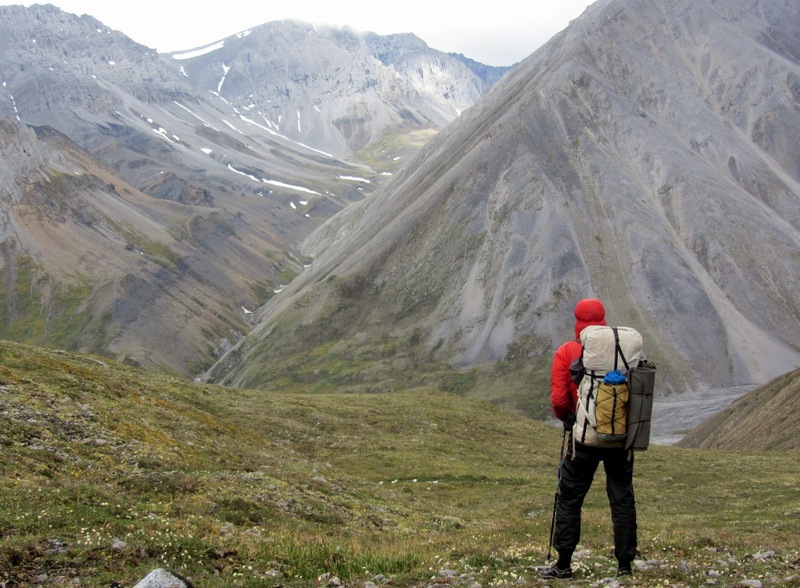 Congratulations on hiking the Brooks Range. This is a trip I've thought of doing (I was in the Yukon in 2011 and am smitten!) and even toyed with some of the logistics this summer. I look forward to your trip reports (any features planned, UTE perhaps?). Glad to see your confident with the Trailstar. I'm still really getting to grips with mine.